Top seed, China’s Fan Zhendong, the winner two years ago when the tournament was staged in Saarbrücken, Germany, duly booked his place in the semi-finals of the Liebherr 2018 ITTF Men’s World Cup in Paris by emerging successful in the round of the last eight on the early evening of Saturday 20th October. In an imposing manner, he beat Vladimir Samsonov of Belarus, the no.15 seed (11-3, 11-6, 12-10, 11-6), the one player remaining who had competed in the group stage of proceedings one day earlier. Fan Zhendong made a lightning start; he dominated the opening game; true to his style, his counter top spin ability was very much to the fore against a player who also excels in that art. Earlier in the group stage and opening round, Vladimir Samsonov had been able to control proceedings at the crucial stages; it was not until the third game that he adapted to the unerring play of his adversary. Level at 3-all and at 6-all but he was never able to establish a meaningful lead. Success for Fan Zhendong by the minimal two point margin; now confident, he blossomed; he dominated the fourth game, the penultimate round place was booked. 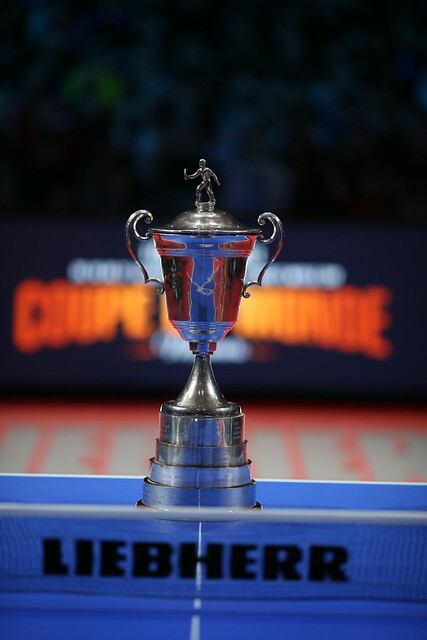 Notably, it was the third time when Fan Zhendong and Vladimir Samsonov had met in the international arena; it was the third time that Fan Zhendong had won. Previously he had succeeded on the ITTF World Tour in Germany in 2013 and three years later when they had confronted each other in Qatar.